Learn About Our Webinar Subscription Packages! Gaye DeCesare joined CU Service Network as Vice President of Compliance in April, 2017, with the company’s acquisition of COMPASS 4 CUs. 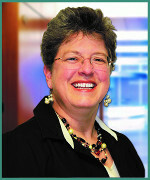 She had served as the President/CEO of that organization since its inception in 2010. Prior to that, she held positions with Belvoir Federal Credit Union (2005-2015) and State Department Federal Credit Union (1984-2005). Specializing primarily in compliance for more than 25 years, she served on the NAFCU Compliance Standards and Practices Commission that developed the NCCO certification program and is a founding member of both the Capital Area Compliance Roundtable and regional BSA Compliance Roundtable. Gaye is also a current member of Global Women's Leadership Network (GWLN), which connects and empowers credit union women from around the world. Gaye was among the first in the nation to earn the designations of NAFCU Certified Compliance Officer (NCCO) and CUNA Credit Union Compliance Expert (CUCE) when the programs were introduced in 1997 and 2000, respectively. In addition to holding NCCO and CUCE designations, she is also a certified Bank Secrecy Act Compliance Specialist (BSACS). Gaye is a nationally-known speaker, having presented to credit union organizations at the federal, state and local levels. Dealing with a deceased member's account can be an emotional for all concerned and can have legal consequences if not handled properly. Every account will have a UNIQUE set of circumstances. Take this time to make certain staff handling accounts understand the consequences that can arise from mishandling funds paid to estates and beneficiaries. Member service representatives, branch administration, branch managers, tellers, training and development staff, compliance personnel, and anyone who handles member accounts will benefit from attending this webinar. Please note: This site employs features that may cause unexpected behavior in older versions of Internet Explorer. If you experience a problem, try refreshing your screen. If this doesn't solve the problem, click on this link. You may contact us by using the Online Chat button below. This 1.50 hour event was recorded on Tuesday, November 13th, 2018. This site is managed for Total Training Solutions by CUWebinars.com and Total Training Solutions - TTSTrain.com. CUWebinars.com is © 2019 & All Rights Reserved By Total Training Solutions. We will now redirect your browser to our credit card processor - https://www.paytrace.com - for entry of credit card information. Direct credit card processing is temporarily offline. We apologize for the inconvenience. Please choose the 'Bill Me' option. If you leave your email address we will notify you when service is restored.